A few days ago, the kids and I decided to make a maiden voyage to Brian's "new" office. "New" in parentheses because they've been in this new building for more than a year. Can it be more than 2? It probably is. The drive went much faster than I had anticipated. Gabe started falling asleep, but we started a round of "The Storytellying Game" and it kept him awake. The Storytelling Game is sort of like a live MadLibs/improvisational storybuilding game. Most of the time I am "it," but Lucy will take a turn once in a while and even Gabe will if his mood is right. I was happy that when I stopped the story and got Gabe to fill in the blanks, nothing had to do with poop or farting. (It's the small things.) No, this story was about a boy and his giant (as big as a building) wolf. Charlie added a tiger to the story. I forget how the story unfolded exactly, but there were mice involved and magical shrinking. The kids were beyond excited to see Brian's office. He joked that he had to have them come so they wouldn't wonder any more if he actually does leave for work every day. After the grand tour, we all piled into Brian's truck and headed south to a favorite burger joint of his. Lunch went reasonably well. There was that episode of a cup full of Powerade spilling all over, but it mostly ended up on the floor. Eight years into this parenting thing has left both Brian and me very skilled with paper towels and/or napkins, so it was no big deal. I was even able to lure a company guy over with his mop and bucket to get the job done right. While I was still twisting around in my seat, trying to figure out what Gabe was talking about, Gabe started to send his chin forward a little. That's when I realized what he was talking about and alerted Brian. "Gabe is throwing up." While we cleaned up on the side of the road as best we could, I told Gabe that no matter what, if he is ever in a car (or truck) and feels like he has to throw up, he can and should yell it out and we wouldn't care. When I was young, I was with a friend and her family on a ride somewhere fun. I had been screwing around with the power windows right when we got in her dad's car, and I was quiet until he parked at our destination and turned off the car. "Excuse me," I said. Mr. Stanford turned around after I said this a couple of times. "Could you please roll down the window?" He looked at my hand, which had been up at the top of the rear window the entire drive. "My finger's stuck in the window." This episode isn't incredibly clear in my mind, but I'm pretty sure that's pretty much how it went down that day. When he asked me why I didn't say anything, I said, "My dad told me that we shouldn't disturb the driver." And that was true, but I think that mostly I just felt dumb for having been messing around with the windows (which led to my friend's dad locking them). I would like to report that Gabe learned to speak up when he felt sick, but a few days after this, he launched barf all over the floor at the gym where he and Lucy take tumbling classes. After I cleaned up that mess, on the way home, he gave me a glimpse into his mind. "Mom," he said, "When I was on my way to the bathroom and I was throwing up, there was a girl texting and she saw me throw up and she said, "Ew! Gross." He was so embarrassed, he left the building. We found him standing beside the door outside. Maybe next time he will make it to a can. People are like art. Don't you think so? Or music... People are like art and like music. Here's what I was thinking. People are fascinating to me. I love them. The problem with a statement like that is that it has no oomph. It's way too general: "I love people." It could mean a lot of different things, really. First, what does it mean, to "love people?" Does that mean that I... like humanity? Really? You LOVE every individual in the world? That's a hard sell, frankly. I guess appreciate might be closer to what I mean. Even with a word like appreciate (that allows for the inevitable distance between me and nearly all of the rest of the human race) it still rings a little false. How can I appreciate what I don't know? Even what I do get a chance to observe is only a fraction of a fraction of everything human that could be observed... No, appreciate doesn't really work, either. But what about art? What about music? It's not too strange to call yourself an art lover or a music lover, right? What fits under the art umbrella? Cave painting, impressionist daubs of hand mixed paint, simple pen and ink, sculpture, installation art, photo realism... Art is something that we can experience with our eyes (and sometimes other senses) that is made to evoke a response from us or tell a story. (Yes, that definition is mine. Here is a much better qualified definition. ) Art is an effort to capture beauty, initiate change, make us curious, frighten us, terrify us, or educate us. And music is just as broad. Music... At Thanksgiving dinner this year, a brother-in-law of mine said he was thankful for music. When you stop to consider how music enriches your life, you might find that you become more consciously grateful for music, like I did. A parent's lullaby, a soaring movie soundtrack, deathmetal scream fest, the latest top pop song, the unfamiliar rhythms from someone else's continent... Music is amazing. Music, for me, gives my soul room to spread when it connects with my own emotions. I'm fascinated by the difference in what people connect with, too. I've heard from a lot of people that deathmetal is relaxing. For me, it's the opposite. To some people, though, music that makes me angry, lets them feel peace. That's what I've been told. But I'm not trying to talk about art or music. I want to talk about people. No, I don't know every individual incredibly well. Obviously. I probably only know a handful of people really, really well. But I love watching people live their lives. I love trying to be aware of what secret histories may motivate him or her. I love seeing similarities and how they combine differently with different character traits or lifestyle choices. Maybe I can draw a comparison with music and Pandora here. Put the name of a song into Pandora, and a complex decision procedure will search out similar songs using nearly 400 different attributes. music, for example, gender of lead vocalist, level of distortion on the electric guitar, type of background vocals, etc. Rock and pop songs have 150 genes, rap songs have 350, and jazz songs have approximately 400. Other genres of music, such as world and classical music, have 300–500 genes. The system depends on a sufficient number of genes to render useful results." In art, of course, you have hundreds of attributes as well. Has anyone done an art genome project? ...Don't mention it. It was no trouble. To be honest, I am a big fan of visual aides, too. First of all, when I was in high school, I had some long, written conversations (notes passed back and forth) with a friend in math class. The only "conversation" I really remember is the one we had about Love and Passion. My friend argued that Love was stronger and better. I argued for Passion. I see his point now. I could argue still for Passion, but it would just be for fun. Love is bigger and deeper. Love includes patience and self-sacrifice. Love is like the ocean. Passion like a wave. High School Me might've said that Passion is the wind that fills the sail. (Pretty sure I did write that.) Middle-aged Me would say that Love is the ocean that holds the boat. I bet there are a lot of people out there who think about their calling(s?) in life. For me, it has been something I've come back to since... well, since I started to think about the future. Probably when I started playing house or playing school with friends, and when I actually thought about the perennial question adults ask kids: "What do you want to be when you grow up?" That was always my answer--until I realized there were, oh, a million different jobs and not just 10: a teacher, a fireman, a doctor, a lawyer, a farmer, a banker, a police officer, train engineer, artist and a pilot. Of course, those are random, but eight year-olds don't usually consider careers in Public Relations Management or ... Sheet Metal. I always said I wanted to be a teacher, but I think I really just wanted to be a mom. I've also wanted to be a doctor, a writer, and artist and... a teacher. Passion. Now we're getting somewhere. An exact definition helps. What would your list look like? How many of the passions in your life do you get to dabble in daily? Until tonight, I hadn't realized that I've never had a drama-free violin practice session with Lucy. But it is possible! It happened! Amazing! I know, she doesn't look very excited. 1) Will my kitchen table ever again serve as anything other than a (messy) Christmas staging area? Yes! As I wrote on Christmas Eve, we did eat dinner on the table. And that surface became a prep space directly afterward. 2) Will I address and send all of the Christmas cards I have before the 25th? 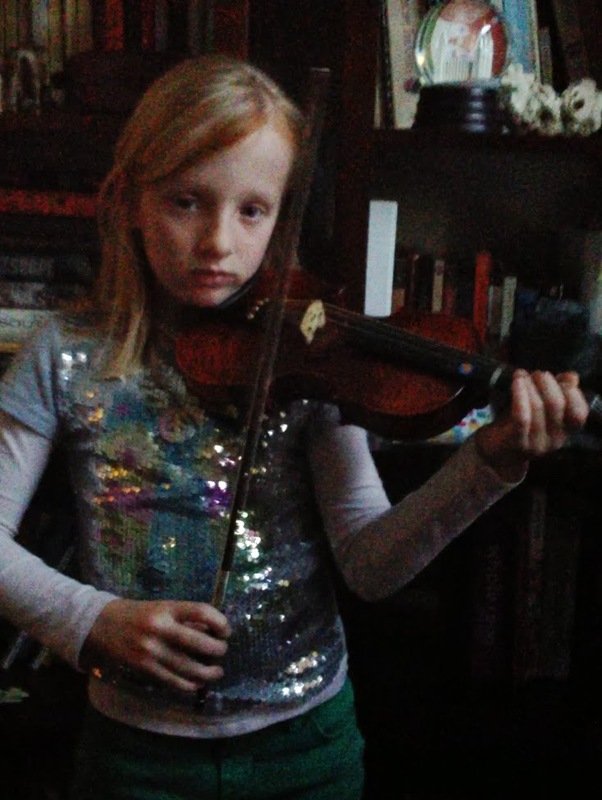 3) Will Lucy practice her violin again before performing with the local Suzuki Strings group? Nope. But it turned out well anyway. 4) Will any of my children make it to school this week? Lucy made it back for Friday. Little victories. 5) Will Gabe ever go to preschool again? Yes! And although he complains A LOT about going almost anywhere, including birthday parties, he is satisfied and happy when I pick him up. 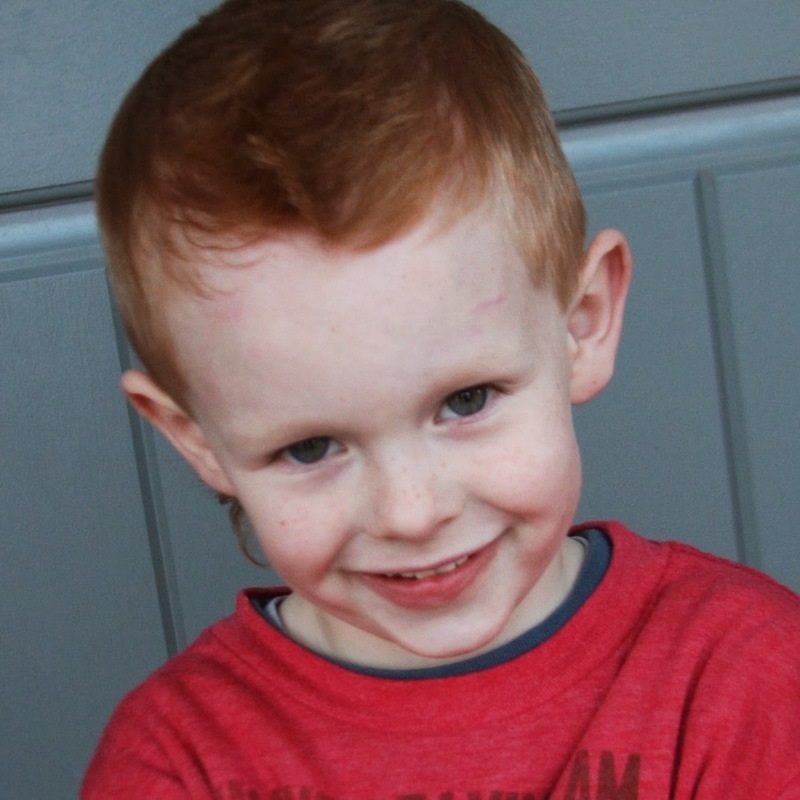 6) Will my children discover my Christmas gift hiding spots this year? 7) Will I ever again get to go to my adult gymnastics class to learn the art of artfully flinging my middle-aged body upside down and rightside up again? Yes! But this is still hard. I can't seem to get the world to stop allowing other things to happen on gym night.